This area is famous for the karst landscape (limestone hill formations jutting up from an otherwise level ground and the subject of countless traditional Chinese paintings. This area is also riddled with caves used extensively by locals to hide when the Japanese invaded during World War II. From Wuzhou we head north for three days to Yangshou where we will take a day off to do some local sightseeing, or just hang out in this backpacker-traveler town. We will continue north to Guilin and Longsheng in to the mountains where there are some hot springs to relax in. The next stop at Sanjiang brings us into to one of China's many minority areas where the Dong people live. 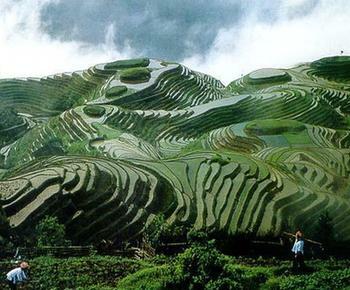 This mountainous area is offers some of China's marvelous landscapes of mountain sides terraced for rice fields. While the grades are rarely over 10% the length of climbs can be 20 km long. If this is too much we can either get a lift up the hills either in the back of a "walking tractor" or on a local bus. We continue westerly through small towns and villages, where we can see how the average Chinese live. The next big stops are Kaili (Miao minority) and Guiyang, the capital of Guizhou. From there we will continue west to Huangguoshu Falls (China's Niagara) where the cycle tour ends. From there we will take a four-hour bus back to Guiyang for connections back to the west. Day 1: Guangzhou/Wuzhou. Meet group members at the airport. Take transportation to Wuzhou. Includes: (B), (L), (D). Day 2: Taiping. Small town life. Includes: (B), (L), (D). Day 3: Mengshan. Site of Yong'an Prefecture City. Includes: (B), (L), (D). Day 4: Yangshou. Heart of the Karst Hill Scenery, Moon Hill and Black Buddha Caves. Includes: (B), (L), (D). Day 5: Yangshou. Rest Day, 25 km boat ride up the Li River, explore fishing village. Includes: (B), (L), (D). Day 6: Guilin. Explore Guilin's sights including Seven Star Park and Reed-Flute Cave. Includes: (B), (L), (D). Day 7: Jinzhu. Zhuang Minority area, rice terraces. Includes: (B), (L), (D). Day 8: Sanjiang. Visit chopstick factory. Includes: (B), (L), (D). Day 9: Sanjiang. Rest Day. Dong Minority: Wind and Rain Bridges and Drum Tower. Includes: (B), (L), (D). Day 10: Fulu. Small village life. Includes: (B), (L), (D). Day 11: Congjiang. Pass through several Dong villages and visit Drum towers and wind and rain bridges. Includes: (B), (L), (D). Day 12: Rongjiang-Rongjiang-Xishan Miao King Temple, Village of Chejiang. Includes: (B), (L), (D). Day 13: Dashi. Mountain pass, cycle mountain area. Includes: (B), (L), (D). Day 14: Leishan. Mountain pass, visit mountain village. Includes: (B), (L), (D). Day 15: Kaili. Center of several ethnic minorities including the Miao. Includes: (B), (L), (D). Day 16: Kaili. Rest Day. Explore outlying minority villages. Includes: (B), (L), (D). Day 17: Guiding, mid-sized city in coal mining district. Includes: (B), (L), (D). Day 18: Guiyang-Capital of Guizhou-Qianling Park, Provincial Museum. Includes: (B), (L), (D). Day 19: Anshun-Hongfeng Lake, Longong Caves and Wen Temple. Includes: (B), (L), (D). Day 20: Huangguoshan Falls. Visit the largest waterfalls in China and Dragon Palace Caves. Includes: (B), (L), (D). Day 21: Guiyang/Guangzhou. Return to Guizhou by bus or truck. Fly to Guangzhou for connecting flights home. Includes: (B), (L), (D).